Drug regulators have heavily criticised the firm which carried out the drug trial which left six men seriously ill.
Parexel - who deny any wrongdoing - failed to follow proper procedures the Medicines and Healthcare products Regulatory Agency have reported. But the agency said the adverse reaction, which left the men with multiple organ failure, was the result of an "unexpected biological effect". Experts slammed the conclusion, saying the outcome could have been predicted. 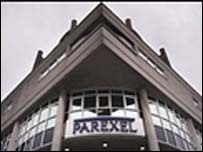 At the time of the trial, Professor Herman Scholtz, from Parexel, said the clinical research organisation had followed regulatory, medical and clinical research guidelines during the study. All six previously healthy men who took part suffered multiple organ failure after being given TGN1412, which is designed to treat rheumatoid arthritis, leukaemia and multiple sclerosis. One is still in Northwick Park hospital, and is said to be making steady progress. The solicitor representing two of the men has called the MHRA report "totally inadequate" and said it was "a whitewash". The MHRA found the drug was given in correct doses and there was no sign of contamination or manufacturing errors. But it lists a catalogue of administrative errors. Parexel failed to complete the full medical background of a trial subject and the medical history of one of the volunteers was not updated. There was also no contract in place between TeGenero, the makers of the drug, and Parexel at the beginning of the trial. In addition, the MHRA reported one of the doctors involved did not have adequate training or experience. The German manufacturers of the drug TeGenero have maintained that the men's reactions were "completely unexpected" and did not reflect the results obtained from the earlier laboratory studies. Dr David Glover, an independent consultant and industry expert on the development of antibody and other biological drugs said: "Today's report is inadequate and completely misses the point. "The report concluded the problem was due to an unexpected biological effect, but this is absolute nonsense. "The trial volunteers' response was predictable from preceding literature and data supplied by the company and should not have come as a surprise." But Professor Kent Woods, MHRA Chief Executive told the BBC other monoclonal antibodies, like TGN1412, had been tested safely before, and there had been substantial safety measures built in to the study's development." However he admitted: "The number of volunteers is something that has to be reconsidered. "But even if one volunteer had been affected, it would have been a disastrous outcome." He added: "We are satisfied that the adverse incidents which occurred were not as a result of any errors made in the manufacture of TGN1412, its formulation, dilution or administration to trial participants." It its interim report last month, the MHRA said it would take a "precautionary approach" to future trials of drugs like TGN1412. But Ann Alexander, the lawyer representing the two most seriously affected victims of the drug trial, condemned the report as "totally inadequate". "Today's report is a whitewash and leaves many questions unanswered. It gives no detailed information about the pre-clinical trials, about which there has been conflicting information." Ms Alexander, of Irwin Mitchell solicitors, questioned the finding that the reaction produced by the drug was unpredictable and called for an independent enquiry. She added that a Health Select Committee report published last year had found a lack of transparency in the MHRA. "The concerns of the select committee seem to have been confirmed by the MHRA's investigations. "I now have little faith in the MHRA's ability to seek, obtain or make public detailed and relevant information about the clinical history of this trial or the manner in which it was conducted," she added. The Department of Health has said the expert group will produce an interim report within three months of starting work. It will provide advice on how future trials of monoclonal antibodies should be designed.